A recap of China Power authors’ conversation with Reddit’s r/geopolitics community. On April 30, 2015, China Powers authors took part in an Ask Us Anything (AUA) conversation with Reddit.com’s /r/Geopolitics community. The following excerpts are questions and answers taken from that AUA. China Power’s Shannon Tiezzi, Bo Zhiyue, David Volodzko, Kerry Brown, Jin Kai, Xie Tao, Zheng Wang, and Chen Dingding answered questions posed by community members. Excerpts from that conversation are below, divided by topic. If you missed the opportunity to ask The Diplomat authors your question, fear not! We’ll be holding another AUA on June 2, this time featuring authors from our Asia Defense blog. Stay tuned for more details! /r/Geopolitics Community Member (GCM): Thanks for doing this. 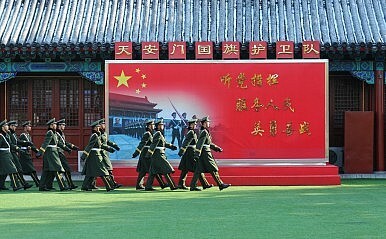 What do you think will be the future of the Sino-Russian relationship in light of their common ideological background? Shannon Tiezzi (ST): This is in some ways the million-dollar question: are we going to see a quasi-alliance between China and Russia or will competition keep them at arm’s length? As you mentioned, Beijing and Moscow have a lot of common interests — particularly minimizing Western (read: U.S.) influence in international governance, with the corollary of increasing their own global clout (and that of other developing nations) through institutions such as SCO and BRICS. China and Russia often seek to provide diplomatic ‘cover’ to each other when either faces criticisms from the West (for example, over the ways their governments suppress political dissent), and that’s likely to continue. As long as Russia and China stick together, neither can be completely isolated by the Western bloc. However, Russia and China aren’t as natural of allies as you might think. Russia remains committed to maintaining its sphere of influence in the old Soviet states (see: the Ukraine situation) — particularly Central Asia. And China is increasingly active in these states and will only become more active as its Silk Road Economic Belt rolls out. That’s setting China and Russia up for competition and tensions down the line. In the short term, I think China and Russia will continue to stay close, if only because Putin and Xi Jinping have developed a close personal relationship. Once these two leaders leave office, though, (and there are questions about when, exactly, that will be for both Putin and Xi) we might start to see tensions climbing. Kerry Brown (KB): What “common ideological” background? When Xi Jinping visited Russia in 2013, beyond all the sweet talk about culture and being close neighbors, I didn’t hear him talk much about there being any close ideological links even in the distant past. After all, Mao was regarded by Stalin as a heretic in many ways, even back in the 1930s. It is an interesting point if Stalin even welcomed the success of the Communist Party of China revolution. Interestingly, this issue of just how close the Chinese and Russian experiences of Communism was has been highlighted by the constant return of Chinese politicians and academics to the question of why the USSR collapsed. Xi alluded to this in his meeting with Hu Deping in mid 2012. I think the current Chinese leaders regard the USSR as incompetent, ideologically bankrupt, and more alien to their way of thinking that the so called capitalist west. Jin Kai (JK): Looking back in history, relations between these two neighbors went through very different scenarios in at least few hundreds of years. The Treaty of Nerchinsk of 1689 (interestingly only 41 years after the Peace Treaty of Westphalia) between Qing China and Tsarist Russia was more or less a clash between China’s tributary system with Western world’s treaty system in a bigger picture. Qing China realized it had to deal with other “major” powers out of China’s own system through a different approach, rather than tributary relations. After Sino-Japanese war of 1894-1895 war, which finally put East Asian tributary system to an end, Tsarist Russia and Japan had another war over the control of Northeastern part of China and the Korean Peninsula. The decades after the 1917 Revolution was actually an even more complicated period when China and the former Soviet Union sometimes cooperate, sometimes confront and antagonize (for example, the 1969 war). The collapse of iron curtain and further the communist bloc in East Europe though did not spread the same fate to China but inevitably taught Beijing a sort of “to be or not to be” lesson. The honeymoon came only after Moscow believed that the West humiliated Russia and then decided to turn to Beijing in the 1990s. Then other regional issues came in, North Korea nuclear issue, Russia-Japan territorial dispute, and of course the role the United States. From a Chinese perspective, 1980s could have been a “best” period in history of Sino-US relations as China and the US virtually joined hand-in-hand to cope with a rather ambitious Soviet Union. Now a relatively weak Russia surely needs China as a balance in its double-headed eagle strategy, and China of course definitely wants Russia to balance against the US when the US returns to Asia, plus, other issues, such as the fight against terrorists, separatists, and extremists come in, and (some) voices in China say China should have an alliance with Russia. Well, alliance comes out of a common threat. The US may try to balance or even contain the rise of China, however the relations between China and the US is simply too complicated to be described or concluded in a single term “threat.” However strongly tied to each other, a genuine alliance between Beijing and Moscow is more or less a fantasy, in view of history and geopolitics. By the way, I don’t see much common ideological background between today’s China and Russia, maybe some commonalities in political tradition/culture. GCM: Indonesia along with 2 other SEA nations challenged the validity of the Chinese claims to the South China Sea. How will the geo-strategic reality reflect in China’s now almost traditional wide claims? ST: China’s “nine-dash line” is vague by design — the question is whether China means to claim sovereignty over the waters within the line (which is not allowed for under international law) or simply over all the maritime features (ie shoals, reefs, islets) within the line. It’s the former interpretation that Indonesian President Jokowi recently declared invalid under international law — see my colleague Prashanth’s analysis for a more detailed explanation. In fact, Jokowi was quick to clarify that he did not mean to declare China’s sovereignty claims to the various islands and reefs within the South China Sea invalid — just the “nine-dash line” that seems to claim sovereignty over the open ocean. That’s a rather long way of saying that ASEAN is by no means united on the South China Sea question. The Philippines and Vietnam have been the most vocal rival claimants, and they are pushing for a tougher ASEAN stance (in addition to pursuing their own bilateral partnerships with countries such as India, Japan, and the US) to combat China’s moves. But other ASEAN countries (particularly Cambodia and Laos) have no desire to go up against China on an issue they have no stake in. China’s been able to take advantage of exactly those fissures to keep making whatever moves it deems necessary to assert control over the region. Realistically, however, most of the islands and reefs China claims within the nine-dash line are actually physically occupied by other nations. That means there’s a definite limit to what China can do to actually expand its claims to the full extent of the nine-dash line. What it’s been doing to date is mostly solidifying its position on shoals and reefs already controlled by the PRC. Building an airstrip on a PRC-controlled reef is one thing; using that airstrip to force Philippine or Vietnamese forces off of another reef would be an act of war and I don’t think we’ll see that from China. As Chinese scholars have often argued, the nine-dash line represents the maximum extent of China’s claims. China actually making good on the full extent of those claims (which would require the use of force) seems unlikely. GCM: What, in your opinion, is the future of China’s relationship with Vietnam, Myanmar and ASEAN in general? Taking into account Vietnam’s protests last year (as far as I’m aware the greatest strain on Sino-Vietnamese relations since the 1979 border war), China’s plans for a maritime “silk road”, territorial disputes, alignments with India, Japan etc it’s almost as though China-ASEAN relations could well define China’s relations with other regional powers. Zhang Wang (ZW): The president of Vietnam visited China recently and the two sides signed a series of documents on economic cooperation. Even though China has problems with Vietnam and Philippines in the South China Sea, China plans on dealing with the two countries differently and will certainly try to use economic cooperation to get Vietnam to be more compliant. The current administration pays great attention to the relationship with neighboring countries and it has changed from a US-first policy to an Asian-first policy. This is also the reason China wants to launch One Belt One Road, to improve relations with its neighboring countries. GCM: What is the likely medium to long-term future for Japanese-Chinese relations? Do you see Japan becoming a sort of “Great Britain of the Far East”, doing everything in its power (like creating alliances with ASEAN and India) to keep China from becoming a regional hegemon? Or, if China becomes big enough, will Japan defer to China? ZW: The current China-Japan relationship is no doubt in an unstable state, but the two countries have huge common interests and they are interdependent in many areas. I’m cautiously optimistic about the medium to long-term relations of the two countries. However, if the two nations do not work on the historic issues and don’t try to narrow the gap of understanding and perceptions regarding the historic issues, the bilateral relationship will always be fragile and highly symbolic. The balance of power between China and the United State will also influence the future development of the China-Japan relationship. David Volodzko (DV): Just to add to what Zheng Wang has noted, you may want to keep an eye on the upcoming August 15 shusen kinenbi (終戦記念日), or End of War Memorial Day, when Japanese leaders (contrary to popular opinion in Korea and China) traditionally issue the Murayama Danwa, or Murayama Statement, apologizing for past aggressions. If Abe does not do so this year, and if he follows that up with a visit to Yasukuni Shrine, we will certainly see an immediate impact on Sino-Japanese and Korean-Japanese relations. Xie Tao (XT): The current state of relations is certainly lamentable and unfortunate. Regardless what Japan did to China, Chinese leaders should recognize that East Asian security and prosperity are unthinkable except when Japan is an active, responsible, and cooperative member of the regional community. No Japan Left Behind, if I may. Japan is a geopolitical given; China cannot do much about this fact, unless Japan embarks on a road of continuing decline. Remember since Meiji Reform, Japan has never seen a powerful China, and China never gotten a chance to see a weak Japan. Now that is happening for the first time in more than 150 years. Psychology formed during 150s is hard to change and adapt. it takes time and many other factors. GCM: It seems when China want to open overseas market, it faces a lot of hostilities and protectionism from western countries, in some third world countries the West could use their political influence to counter Chinese companies’ bids. As the global market is important for China’s industry, what do you think China should do to avoid these kind of protectionism? DV: Good question. I think ultimately it may come down to business practices within those countries, the local political climate with regards to China, pre-existing U.S. interests in the region and, of course, a bit of soft power. One thing China could improve on in the future might be contributing more meaningfully to local economies. For instance, bringing in its own workers, using its own equipment, having those workers live and eat on-site, and then withdrawing can leave some communities feeling cheated. Naturally, the same goes for any nation following such practices. Another problem is a lack of transparency. Local contractors can feel frustrated having to deal with on-site business who must relay back to officials in China, slowing the process down and delaying developments, payments etc. ST: Just to expand a bit on David’s reply — the concerns you raised (about protectionism at home and politically influencing economic decisions abroad) are exactly the same concerns many Western countries have about China. It’s important to remember that — these complaints about trade go both ways. Just as Huawei got blocked from the US market for security reasons, China is trying its best to remove foreign IT firms from its markets out of the same concerns. These are issues both sides will have to handle through negotiation and compromise. And China is enjoying greater success in some countries where those talks have been successful — look at the deal signed last year for a Chinese firm to enter the UK’s nuclear power industry. In terms of addressing China’s woes, I agree with David about the importance of having firms “go local”. China’s also improving governance of its companies, which will help improve the image of Chinese firms abroad. Huawei, for example, got stonewalled largely because it wasn’t transparent enough about its relations to the Chinese government to satisfy the US Congress. As Chinese firms brings their governance and oversight procedures more in line with the Western world (which is already starting to happen), these sorts of issues will die down somewhat. KB: Basically, allow the non-state sector to take the lead. On the whole, the Chinese non state sector is less distrusted and regarded more leniently outside of China. It can act in some ways at least as the softer side of Chinese economic internationalization. The second means is through China being more generous with allowing access to its own domestic market. You way that China has lots of suspicion and issues when it tries to allow its companies to operate abroad. But foreign companies are working against massive pressures and issues within China. It is a tough, tough, tough market to really succeed in. More equal access would be a big help. I think China is entering a period where it is engaging in a number of bilateral free trade deals to sell access to its own domestic market in order to get better quality access to outside markets. Singapore, New Zealand and Iceland have all signed FTAs with China, with Australia due to finalize its own at the end of the year. So this markets an end of the WTO `moment’ of global deals, and more an era of competitive bilateral free trade deals. GCM: More and more industries in China are moving to either southeast Asia or back to the USA because of TPP. Is there any way to save China’s industry decline? 1) Increasing living standards in China, which leads to increasing wages. The days of China as a cheap source of labor are ending — and the age of organized labor looks to be slowly gaining steam (despite obvious political sensitivities). It’s cheaper now to set up shop in Southeast Asia or elsewhere, and that’s a sign of China’s success in developing its own economy. I think that simple fact is more important than the TPP in encouraging firms to move their industrial bases. 2) China itself no longer wants its economy to be based on being the “world’s factory.” That designation comes along with a heavy dependence on exports and a ceiling for future growth. China’s economic reforms are designed to pave the way for a transformation from an industrial-based economy to a service-based, innovation-based one. So in some ways, a decline in China’s industry is exactly what Beijing wants. That being said, employment is obviously a major concern for China’s leaders — they don’t want massive unemployment to result from the relocation of factories. But Beijing has a number of policies they can implement to encourage investment, including making it more attractive to invest in China’s western regions, where standards of living and thus wages are relatively lower. China wants to bring industrial capacity west along with its Silk Road. GCM: I’ve thought about this before. Recently the secretary of finance Lou Jiwei claimed that China’s mission is to avoid falling into “middle-income trap”, so I think the government still want the factories to stay here. Employment rate is surely the important factor in here: from high-speed development to “new normal”, it is obvious the GDP growth are already slowing and the unemployment rate are already on the rise. How can China create jobs for millions in a very short span of time? It takes some time for China to change. Furthermore, we [Note: this member is from China] have 1.4 billion people, and most of them don’t have college degrees. In some places it’s hard for kids to even finish high school. If we just let the factories leave and go service/innovation-based, that does sound good for us educated college students, but it’s also bad news for tens of millions of peasant workers. They lost their jobs but you cannot just tell them to go back to their farms, since they already lived in the city. That’s another concern for the government. If the real estate market start to flop, then things will be even worse. Any choice is a bad one for a country with 1.4 billion people. It’s like a “pick a poison” situation for the government. ST: I think that’s where the push west comes in — China wants to transition its already developed eastern/coastal regions to a service/innovation-based economy, while repeating the pattern of industrial-based development in the relatively poorer west. In that case, we could see migration patterns begin to reverse, with undereducated laborers moving to central and west China to follow the factories. And remember that the service industry also offer opportunities for the less-educated as well — everything from restaurants to hair salons can be considered part of the service industry, and demand for those services will rise as China’s middle class grows. That in turn should help create more jobs for the lower class. But it will be a very, very difficult transition to get right, which is why Beijing is so nervous about the economic slowdown happening too fast. Keeping employment rates steady during the transition is China’s #1 concern. What is the relationship between the ethnic issues in China and China’s territorial integrity, as well as the role of ethnic problems in the state’s relations with foreign powers? Adding to that, I’ve been reading about Tibet, and from a Chinese perspective is it seems odd that there is so much criticism from the West. Why has resentment of Chinese rule in Tibet been so persistent in the West? KB: Some argue that the current geographical extent of the People’s Republic was settled in the mid Qing dynasty, three centuries ago. I heard an analyst call China an `empire’ rather than a country only a few days ago. This probably drives the idea of how China does carry internal fractures within itself. What is, for instance, the real cohesion between Xinjiang, Tibet and then central and coastal provinces of China. In the early 1970s, during the mid point of the Cultural Revolution, especially around the time of the fall of Lin Biao, Mao’s supposed heir and successor, there was even talk of Guangdong becoming a separate country, though this proved highly fanciful. Yunnan was assimilated in the Song and Yuan Dynasties. Over the centuries, China, or at least the conceptual notion of China, has proved very fluid. Two experts from Beijing on Chinese history recently argued that in fact, in the past, Chinese dynastic leaders had no real concept of what a border for a country actually was. For them, China was a cultural sphere. That idea perhaps still lingers. Fiscally, however, China today remains highly centralized. Most government revenue goes to Beijing, and is disbursed back to provinces from it. There is also a concept of China that is much more centralized and cohesive. For ethnic issues, the discourse of China on these matters was to a large extend either taken from Sun Yatsen’s work, or from Stalin, and his notions of national minorities. The issue really is that in matters like Xinjiang and Tibet, in the last few years, even after major unrest in these places (2008 and 2009 in particular) and then response under both Hu Jintao and then Xi Jinping has been to remorselessly focus on economic development and assume that in the end this will solve everything. In its internal politics, China is not a flexible place to accept identity politics. But there are many in Tibet and Xinjiang who simply don’t see the world in such purely economic ways. For them, their identity as cultural or religious communities is much more important. I get the sense that the elite leaders in Beijing are very, very loath to cede this at the moment. As for western resentment, well, the bottom line is that the Tibetan government in exile has been much more dextrous, particularly through the Dalai Lama, at speaking and presenting its case in ways that garner it sympathy than the responses of the central government in Beijing. One only has to look at the language of the most recent White Paper on Tibet issued from Beijing in April to see this. It makes very harsh demands, and is presented as a being a sort of all or nothing choice. On the whole , western audiences would probably side with the underdog. And while they might not be well informed about conditions in Tibet, or some of the issues that for instance Beijing academic Ma Rong highlights about just how dependent Tibet is on central subventions, they do feel that Tibetans have been treated harshly. Perception is everything in these issues. I would recommend the excellent work of Emily Yeh of, I think Cornell University here, who really maintains good balance and presents her research objectively and well. She is one of the few researchers who had been able to work in Tibet. GCM: Once again, thank you first for your efforts in answering all our questions. Is there any particular economic interest for China to maintain their control over Tibet, or is this just a display of power and dominance? Is it possible for the Tibetan people alone to gain complete independence of China, or do they absolutely need foreign assistance? Furthermore, suppose they were to become separated from China through some sort of civil war, how would that affect the central government of PRC both in a domestic and international sphere? KB: These ideas are somewhat hypothetical. The Dalai Lama himself has not asked for `independence’, but a higher level of autonomy. As a landlocked country, caught between powers like India and China to, Tibet as a territory would occupy a very contested and scary neighbourhood. For defence, economic and other reasons, it is hard to see how it might be allowed to become separate. So an independent Tibet is a remote possibility, A better governed, more autonomous Tibet, however, is a much more fruitful concept. DV: One major economic interest is the fact that the Himalayan-Tibetan region is home to the so-called Third Pole, the headwaters for much of China and SE Asia. Anyone who has ever taken a train or bus in China probably recalls seeing bottles of water labeled 5100 Tibet Spring. So Tibet gives China control of much of the region’s water, as well as access to a great share of its own, therefore Tibet is of such massive economic and political importance that it is very unlikely China is going to humor Tibetan independence calls in the near future. For the full transcript check out the AUA in full on /r/Geopolitics. The next AUA will be with Asia Defense!